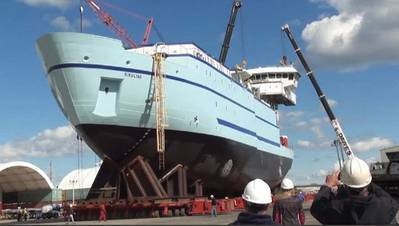 The 3,800-ton Alaska Region Research Vessel (ARRV) R/V Sikuliaq was launched on Oct. 13, 2012, at Marinette Marine in Marinette, Wis. Sikuliaq (pronounced see-KOO-lee-ack) will be operated by the University of Alaska Fairbanks (UAF) School of Fisheries and Ocean Sciences for the National Science Foundation as part of the University-National Oceanographic Laboratory System (UNOLS) fleet. The 261-foot global class ice-capable research vessel R/V Sikuliaq was designed by Glosten Associates. "R/V Sikuliaq is one of the most advanced research vessels in the world," said NSF Director Subra Suresh. "Its capabilities to operate in extreme ecosystems will serve the science and engineering research communities for decades to come, while providing opportunities for educators and students to learn first-hand about the Arctic environment." Sikuliaq is an Inupiat word meaning "young sea ice." "The name 'Sikuliaq' reflects both our Alaska heritage as well as our focus on arctic research," said UAF Chancellor Brian Rogers. According to Gary Smith of UAF, the Sikuliaq project director, the ship will be available for science operations beginning in 2014. UAF's Seward Marine Center in Seward, Alaska, will be her home port. The vessel will be uniquely equipped for operating in ice-covered waters, with a reinforced double hull, two rotating thrusters, and scalloped propeller blades enabling it to break through first-year ice up to 2.5 feet thick. The integrated 5,750 HP diesel-electric plant features AC propulsion motors and tractor style Z-drives. The ARRV was designed to be environmentally friendly from the keel up, and to “Incorporate commercially available ‘Green Ship’ technologies to the maximum extent practicable without significantly impacting the cost of construction or the vessel’s daily rate,” with “particular attention…placed on alternate fuels and propulsion." It’s also the most accessible research ship, built to ADA standards, with elevators, automatic door openers, handicapped accessible passageways and heads. Sikuliaq is the replacement for R/V Alpha Helix, which was 40 years of age at the time it was taken out of service in 2006 and the oldest ship in the National Academic Research Fleet. The ship was built with funding provided by NSF through the American Recovery and Reinvestment Act. According to an NSF press release, NSF invested nearly $200 million into R/V Sikuliaq, which was the first and largest single award made using NSF's Recovery Act funds.